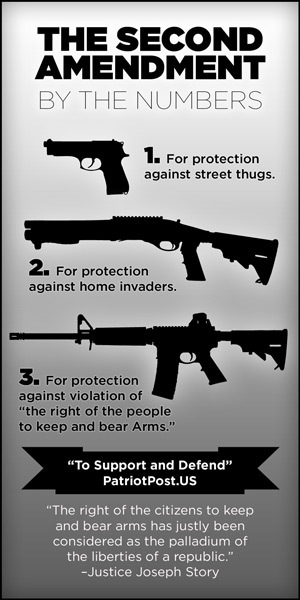 I hereby make this declaration: I will not comply with any executive decree, law or judicial diktat that violates our innate right to self defense, or the defense of Liberty enshrined in our Constitution and authorized by its Second Amendment. It means I will neither register with, nor surrender to the government, any weapon in my possession. I further declare that I am not in possession of any weapon, weapon component or ammunition that has not been lawfully acquired for lawful purposes, including defense of self and family, home and property, and most importantly, defense of Liberty in accordance with the Second Amendment. I have spoken with my family and our Patriot Team about the potential consequences of this public declaration, both for our families and for our company. They fully understand the implications of my very public declaration of civil disobedience in defense of Liberty and Rule of Law. They understand that I have and will abide, first and foremost, by my oath to support and defend our Constitution -- the very oath that Barack Obama and his NeoCom cadres have solemnly sworn, but stand in abject violation of same. Since publishing the first issue of The Patriot Post more than 16 years ago, I have made clear that one constitutional prohibition on the central government trumps all others, and that is the proscription against federal infringement of "the right of the people to keep and bear Arms." Indeed, Supreme Court Justice Joseph Story wrote, in his eminent "Commentaries on the Constitution," "The right of the citizens to keep and bear arms has justly been considered as the palladium of the liberties of a republic; since it offers a strong moral check against the usurpation and arbitrary power of rulers; and will generally, even if these are successful in the first instance, enable the people to resist and triumph over them." Story was James Madison's appointee to the High Court, and Madison himself wrote in Federalist No. 46, "The ultimate authority ... resides in the people alone. ... The advantage of being armed, which the Americans possess over the people of almost every other nation ... forms a barrier against the enterprises of ambition." Just after Obama's re-election, I warned that he would attempt to render neutral the only substantive obstacle between Liberty and his avowed political agenda of "fundamentally transforming the United States of America" -- the Second Amendment. I noted that, per their standard political playbook, the socialists and their Leftmedia promoters would wait on some tragic murder spree, and, in keeping with Obama's game plan to "never let a serious crisis go to waste," use that event as fodder to seize guns. A month after writing those words, a mentally deranged sociopath used a firearm to kill children and adults in a Connecticut elementary school. Before the bodies of murdered children had even been removed from Sandy Hook Elementary, Obama was, shamefully, stacking their coffins to use as a soapbox for his latest and greatest assault on the Second Amendment -- a renewed effort to not only ban the future sale of many defensive weapons, but register them in order to eventually confiscate them. Obama has framed this debate as a contest between "public safety" and the NRA, and insists that the Second Amendment is to protect hunting and sport shooting. Obama claims, "We're a nation that believes in the Second Amendment, and I believe in the Second Amendment. We've got a long tradition of hunting..." If by "hunting" he means hunting down those who offend Liberty, then he is correct. Some Leftist governors and legislators have already adopted Obama's "hunting" misinformation memo. New York's Andrew Cuomo proposed "the toughest assault weapons ban in the nation" this week, asserting, "We respect hunters and sportsmen. This is not taking away peoples' guns. I own a gun. I own a Remington shotgun. I've hunted. I've shot. That's not what this is about. It's about ending the unnecessary risk of high-capacity assault rifles. No one hunts with an assault rifle! No one needs 10 bullets to kill a deer!" If, by "risk of high-capacity assault rifles," he means risk that they might be used for their intended purpose -- to defend Liberty against the tyranny of socialist politicos and those who do their bidding -- then I understand his concern. The fact is, these weapons, which Obama and his cadres want to eradicate, account for only a tiny fraction of homicides in the U.S. According to the FBI's public safety statistics, almost 10 times as many people are murdered annually with knives, hammers and bare hands than are murdered with the type of weapon used in the Connecticut attack. Furthermore, from the time the Senate first banned so-called "assault weapons" in 1994, through the expiration of that ban in 2004 and to the present day, the number of such weapons held by the people has increased by 2.5 million, while murders have dropped by almost 50 percent. In other words, more guns equate to less crime. But Obama is not one to let hard facts interfere with his sacred socialist agenda. Benjamin Franklin spoke timeless words to this contest: "They that can give up essential liberty to obtain a little temporary safety, deserve neither liberty nor safety." In the case of those who would give up Essential Liberty for nothing more than the perception of a little temporary safety with more gun prohibitions, they will, ultimately, lose both. In addition to Sen. Dianne Feinstein's renewed "comprehensive" ban on a long list of defensive weapons, which she plans to reintroduce in two weeks, Obama appointed Joe Biden to be his executive branch lightning rod for this subterfuge. Three weeks ago, Attorney General Eric Holder implied that Obama might use an executive order to undermine the Second Amendment. This week, Joe Biden confirmed that, saying, "The president is going to act. There are executive orders, there's executive action that can be taken. We haven't decided what that is yet. But we're compiling it all with the help of the attorney general and the rest of the cabinet members as well as legislative action that we believe is required. It's critically important that we act." Liberty is "endowed by our Creator," not determined by executive decree or congressional legislation or judicial diktat. Liberty is an innate human right. It is a gift from God, not from politicians. I have, herein, publicly declared that I will not comply with any decree, law or diktat, which violates our Constitution, or the innate right to defend Liberty. I know that there are tens of millions of Patriots who are, likewise, committed. As our Founders affirmed in the last line of the document codifying their rejection of tyranny: "For the support of this declaration, with a firm reliance on the protection of Divine Providence, we mutually pledge to each other our lives, our fortunes and our sacred honor." We will see what happens to a citizen who very publicly dares to challenge Obama's most coveted socialist agenda. Patriots, I am not asking you to make the same public declaration that I have made, but I am asking you to join me in a pledge to defend Liberty by affirming your commitment to support and defend our Constitution and the Second Amendment against all enemies, foreign and domestic.